I remember this - in retrospect somewhat dull - exchange (well enough to paraphrase it) for two reasons: because it was the first time I heard of Sufjan and because his third album, ‘Seven Swans’, could well have been released in the era of the man with whom he shares a surname. 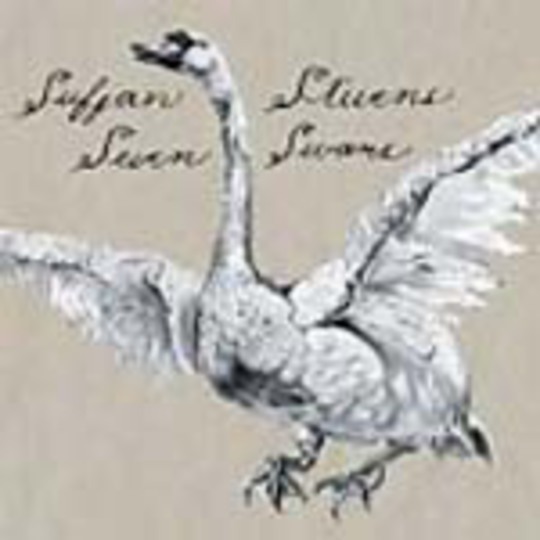 _‘Seven Swans’ _is a record that belies the arching ambition of a musician who has aimed to record an album drawing inspiration from each American State; belies it in consisting of songs both simple and - in the ardour with which those songs are carved – beautiful. Songs you found in the attic of your new home; ancient and idealised - possessed of a sort of faded monochrome perfection. It is a record that marches to the drum of an inner devotion, one that represents the earnest and sober side of its creator as opposed to the eccentric and amusing one evident, for example, in every facet of his own label Asthmatic Kitty. In that respect he resembles Will Oldham, though Stevens’ music is richer and at its core more optimistic than that of the Bonnie Prince. ‘To Be Alone with You’ reveals this: a melancholic acoustic piece, its ambivalence - hushed remorse and faint cheer - becomes clear only in light of Stevens’ chorus: "You gave your body to the lonely... I’ll never know the man who loved me". And for an album so bare boned, so swathed in the intimate, it is easy to ignore how diverse (and strong) the instrumentation of ‘Seven Swans’ is. Each song is built around either warm acoustic guitar or banjo, but quavering keys, a sombre piano, bass and drums emerge too, from time to time, and even a measured electric guitar duets with a lone, sanguine female voice for the first four minutes of the aching and rock-orientated ‘Sister’. Of course, this would mean nothing if the resulting songs did not clasp the attention and failed to find their perfect expression via the warm production of Daniel Smith - but, of course, they do. To dismiss an album as sincere and gorgeous as this because of the notions surrounding music which addresses Christian belief would be – in short - stupid. Stevens has a beautiful voice and a rare melodic instinct but it is the passion with which he performs these songs that causes them to communicate so much, so well; each wrenching repetition of the title track’s concluding multi-tracked exultation is a blow to the chest, an affirmation not of content but of the inspiration that that content has bred. From here on in - whether Sufjan chooses to continue to rejoice within or without the context of his musical documentation of an inspiring natural America – he should be followed; perhaps not least to prevent him disappearing. Give Me The Weekend E.P.